Our last chapter of Kobe Bryant’s 20 Year Sneaker Legacy ended on a low note, with Kobe’s 2012-13 NBA season ending prematurely after going down with a ruptured left Achilles tendon. A 34 year old NBA player who suffered a torn Achilles after already playing seventeen seasons in the league would probably call it quits after that, right? Not Kobe. After a grueling summer of rehabilitation, he would somewhat miraculously be back on the court in less than a year, ready to begin the next era of his signature line with Nike: the introduction of Flyknit. 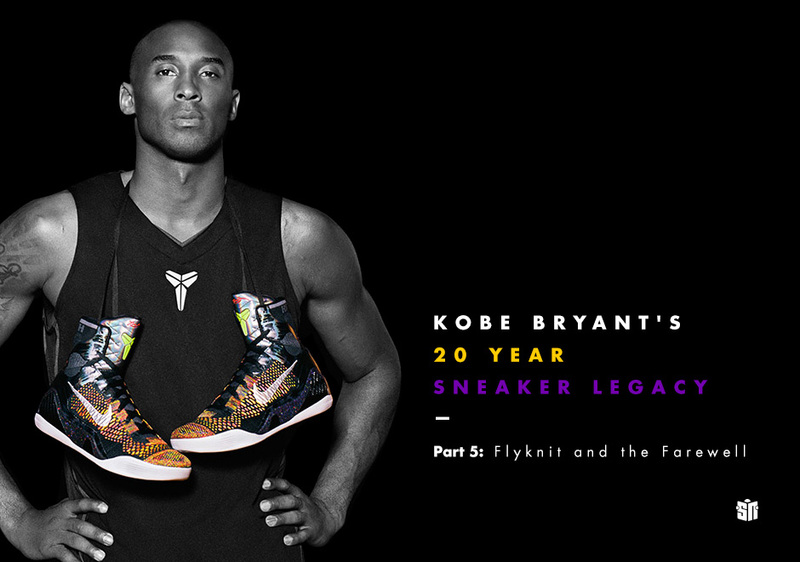 This edition of our extensive look back at the history Kobe Bryant’s twenty years of sneaker history chronicles his comeback and farewell tour, and takes a look at his last three on-court signature models, which have proven to be his boldest and most innovative sneakers yet. After blowing out his Achilles on April 12, 2013, 35-year-old Kobe was back on the court only 8 months later on December 8th—basically the bare minimum for the average Achilles tear recovery time. Kobe’s return to the court would be while wearing the Zoom Kobe 1 “Prelude”, which had just launched one day earlier and was the first-ever Nike Kobe retro model. This Kobe 1 began the Prelude pack, a series of all eight of Kobe’s Nike signatures in special colorways that released in consecutive weeks leading up to the launch of the Kobe 9. The Kobe 1 Prelude featured a colorway inspired by his 81 point performance in 2006 against the Raptors—coincidentally the team the Lakers were playing that night. 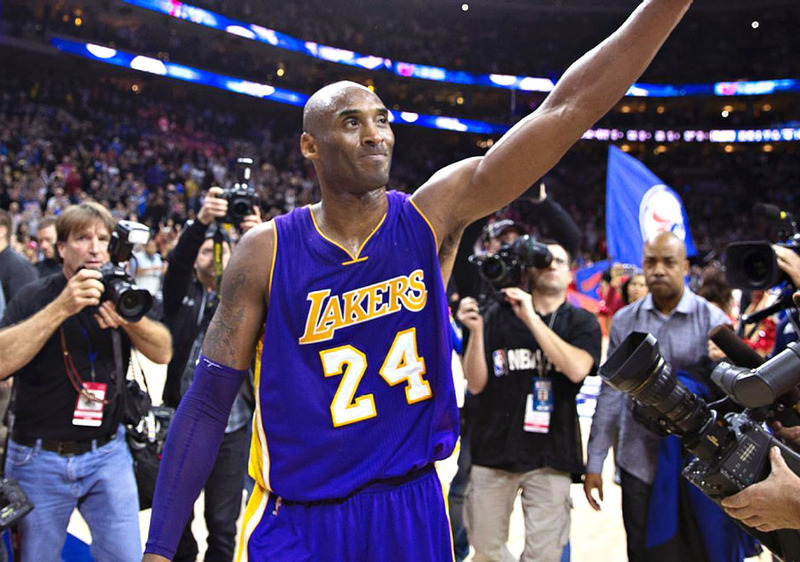 Although triumphant, Kobe’s return would end up being short-lived. He’d be out again following only his sixth game back after hyper-extending his left knee. Originally scheduled to be out for around six weeks, his return date was later pushed back until after the All-Star break, then ultimately for the rest of the season. After his first game back in the Kobe 1 Prelude, he wore the Kobe 8 for his remaining five games, never getting the chance to debut the Kobe 9 on court himself. With the Nike Kobe 9 on the market for months at that point, it was no surprise to see Kobe begin his next season wearing the shoe. 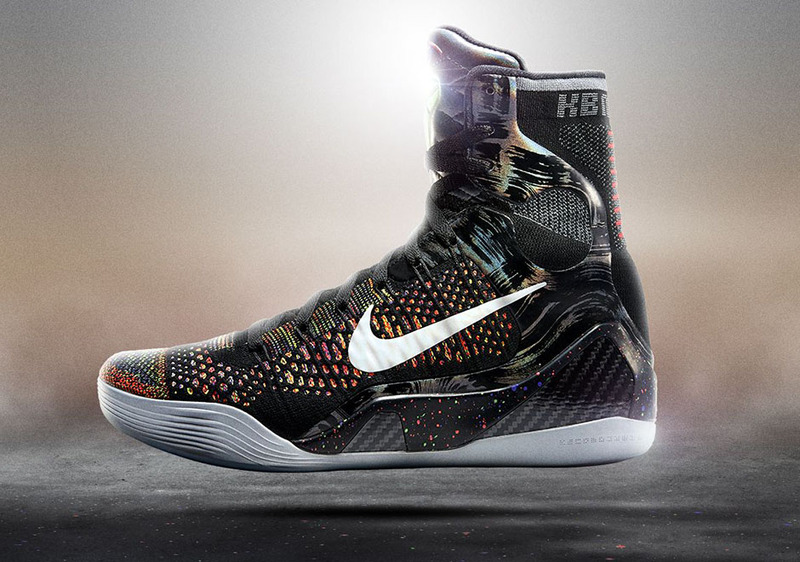 The Kobe 9, once again designed by Kobe and Eric Avar, would be his boldest and highest shoe yet—and a huge departure from his previous five low-top signature models. The shoe marked the first-ever utilization of Flyknit in a basketball shoe, translating the woven textile construction previously seen in running shoes to the hardwood. The Kobe 9 would release in three versions: the initial high-top, the Flyknit low-top, and also a mesh-constructed low-top. All three featured the same Lunarlon cushioned tooling, although both Flyknit ‘Elite’ versions also came equipped with carbon fiber heel and midfoot counters while the mesh version did not. On December 14, 2014, Kobe Bryant hit a free throw in a game against the Minnesota Timberwolves, passing Michael Jordan in NBA career points with 32,293 and positioning himself at #3 on the all-time list. 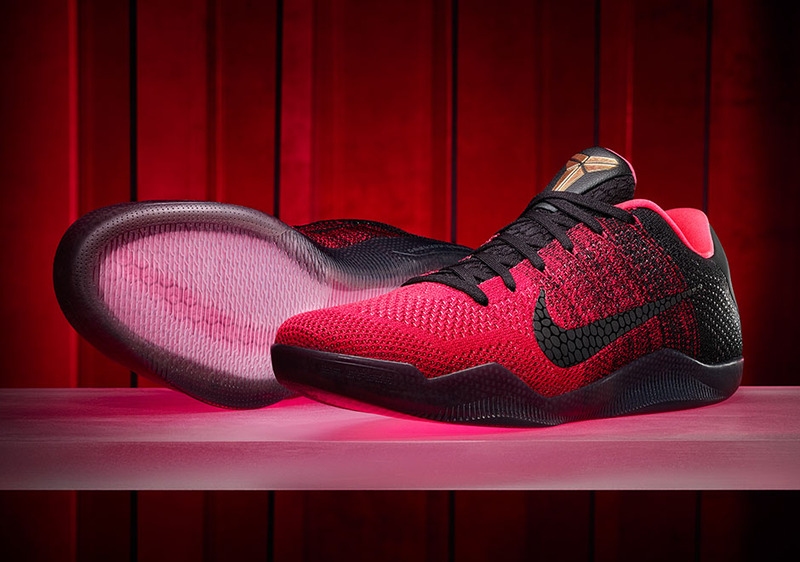 Nike was ready, releasing the “Mamba Moment” Kobe 9 Elite Low NIKEiD option of the same colorway Kobe wore that night. The shoe was available for order for a very limited time only, and came with the green and purple Flyknit upper preset, while the laces, midsole, tongue and Swoosh were customizable for your own “Mamba Moment” colorway. Healthy to begin the 2014-14 season after coming back from his knee injury, things were at first looking promising for the aging Black Mamba. But his return would unfortunately be short-lived once again, after suffering a torn rotator cuff in his right shoulder that would sideline him after 35 games. 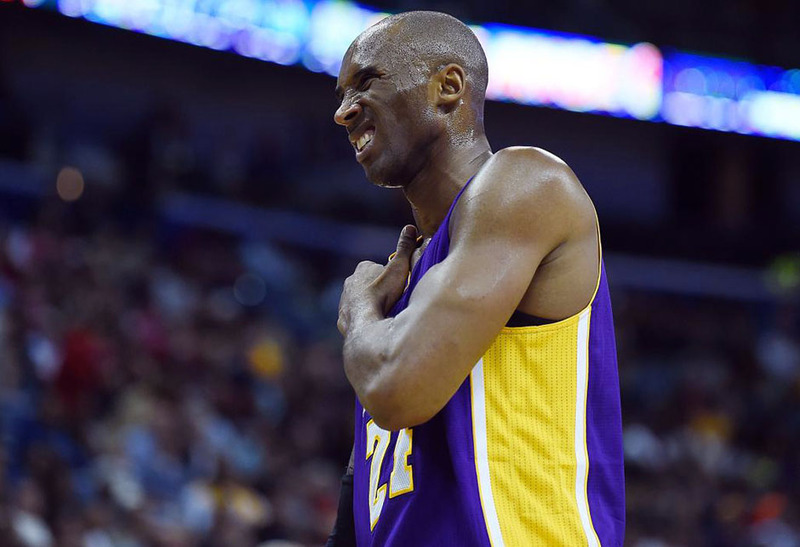 A third straight season ending injury, and one that would again be reason enough for most players in his position to retire, Kobe vowed to return the following season. Also just like the season before, Kobe’s year ended before he had a chance to debut his next signature shoe on court, the Kobe 10. With his last game on January 21st the following season and the Kobe 10 being unveiled on January 31st, Kobe just missed his chance to debut his latest signature shoe on court. No matter, because the the Kobe 10 was able to garner plenty of attention for itself, thanks to its innovative new features and clean, minimalist look. 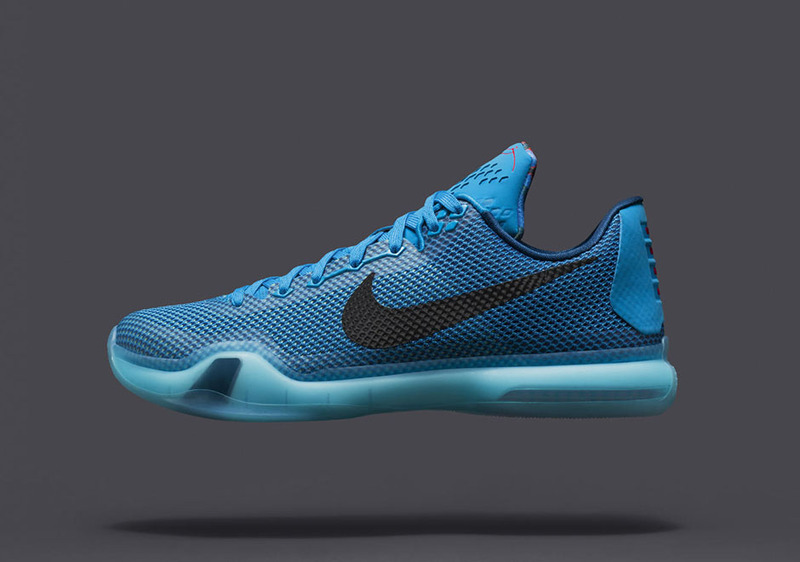 The Kobe 10 debuted with a return to the low-top, featuring a seamless textile upper inspired by the pattern and strength of sharkskin. The shoe also boasted Nike’s most advanced basketball tooling ever, utilizing a hybrid cushioning system with Zoom Air in the heel and Lunarlon in the forefoot made more flexible with Free-inspired siping grooves, all held within a translucent rubber midsole. Along with the initial textile construction, the Kobe 10 also came in ‘Elite’ Flyknit constructions in low and high top cuts—just like the Kobe 9 before it. Kobe would begin the 2015-16 season wearing the Kobe 10 in its high Flyknit version, but also wore the Elite Low from time to time. As many had expected would be happening, on November 29, 2015 Kobe Bryant officially announced that he’ll be retiring after the end of the 2015-16 season. 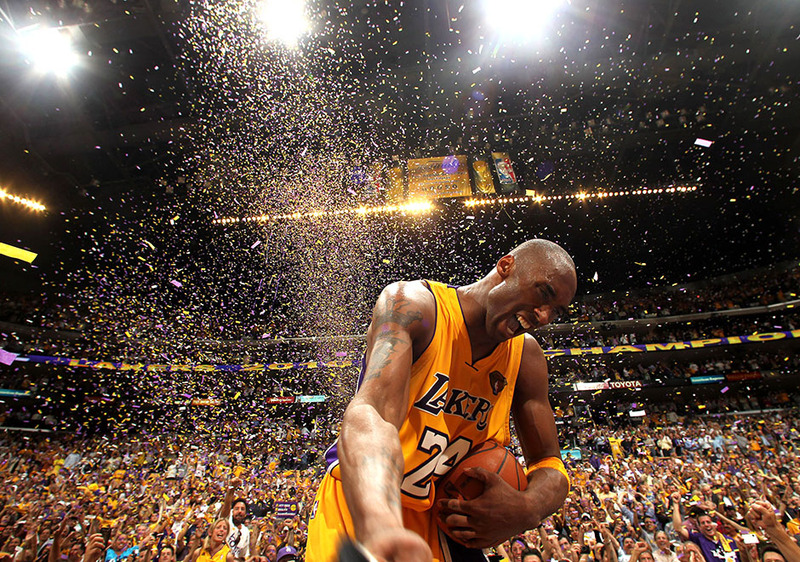 At the age of 37 and nagged by various injuries on a nightly basis, Kobe stated “This season is all I have left to give. My heart can take the pounding. My mind can handle the grind, but my body knows it’s time to say goodbye.” After his announcement, the rest of Kobe’s season has become a farewell tour, with fans at each stop on the Lakers’ schedule who normally booed him throughout the years now cheering to show their respect for the legendary basketball player they all loved to hate. After being unveiled online on December 14, 2015, Kobe debuted the Nike Kobe 11 one month and one day after announcing his retirement, lacing up his new shoe on December 30th. The innovative Kobe 11 features an advanced Flyknit construction that includes TPU yarn intertwined into the standard textile weave for a stronger and more supportive upper, while the low-to-the-ground tooling is cushioned with full-length Lunarlon foam and Zoom Air in the heel. Since debuting the shoe on court in Boston in a game against the Celtics, Kobe has worn the Kobe 11 in an array of PE Lakers colorways, along with the special All-Star edition for the the 2016 game in Toronto and the colorful Black History Month edition. In honor of Kobe’s historic career and time with the brand, Nike celebrates his final season on the court with the “Black Mamba Collection”. 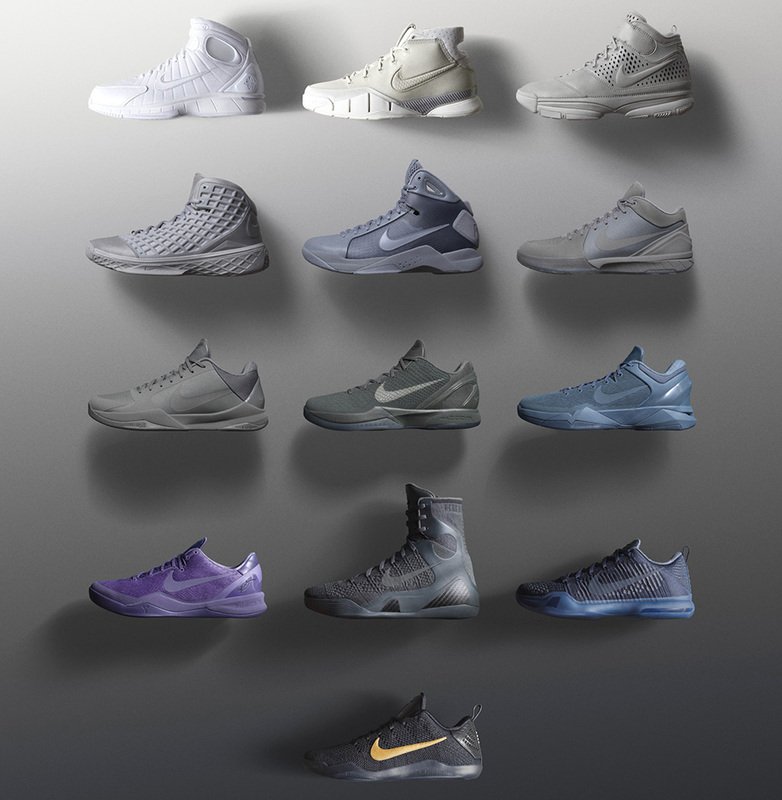 The set of limited edition releases features every one of Kobe’s signature shoes, along with two non-signatures closely associated with him, the Huarache 2K4 and Hyperdunk, in a gradient of tonal white to black colorways as a metaphor for Kobe’s career fading to black. The collection culminates with the black and gold Kobe 11, which Kobe will wear for his final NBA game on April 13th. As it turns out, Kobe’s next era of signature models featuring Flyknit, extra high tops, and more technical sole units than ever would also be the final chapter of his Nike signature line. At least while he’s on the court, that is. Nike has already announced that they will continue the Kobe line after his retirement—just like the Air Jordan line has done without Michael on the court. 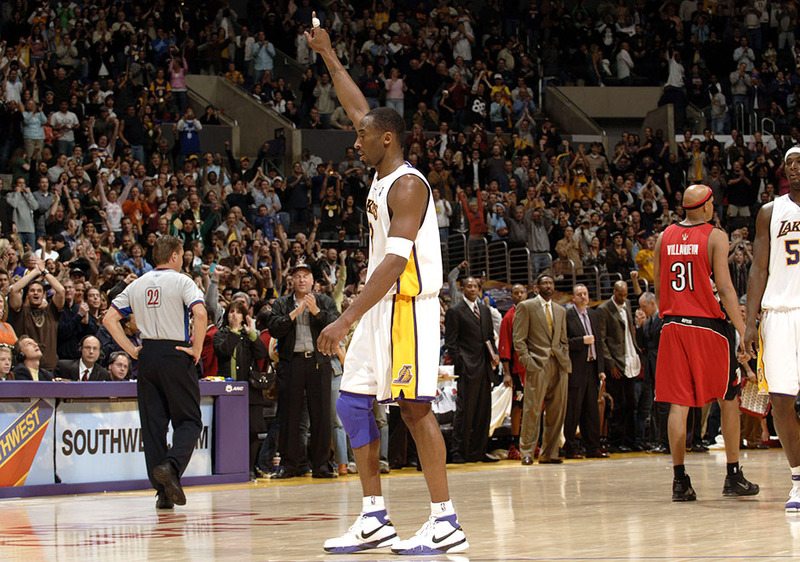 Will Kobe’s line become as respected, legendary, and forever-popular as Air Jordans? It’s a hard act to follow, but you can definitely count on Kobe’s line pushing the limits of basketball sneaker innovation and style for years to come. How can you even sum up Kobe’s historic influence and impact on both the game of basketball and sneaker design in his twenty years on the court? Somebody could, should, and probably will write a book about it, but one word will do for now to keep it simple: Legendary. In every sense of the word. From young Kobe in adidas, to his famous sneaker free agency, to his early days with Nike and the low-top era, review each chapter of Kobe Bryant’s 20 Year Sneaker Legacy.